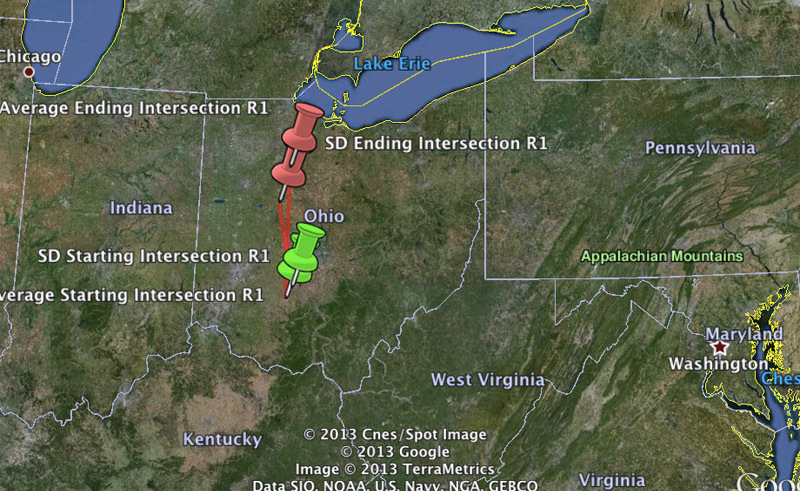 Over 200 witnesses reported a large fireball over Ohio last night around 11:05 PM local central time (3:05 UT). The fireball was seen from primarily Ohio and Indiana, but witnesses from West Virginia, Virginia, Pennsylvania, Kentucky and North Carolina also reported seeing the fireball. 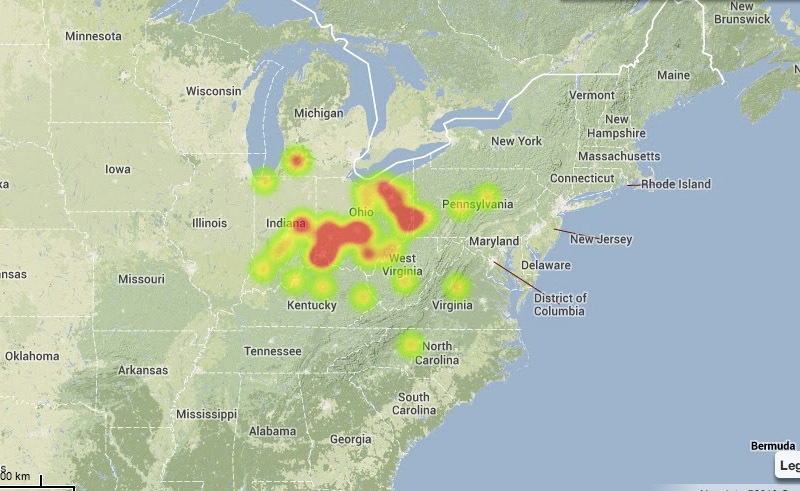 Here is heat map for the event that shows where the witnesses reported from. Click the image below to review the event map and witness reports for this fireball. The AMS has developed technology that can plot the trajectory for any fireball reported to our system. The accuracy of these trajectories is dependent on the number of witnesses who report the event and their distribution around the fireball. This event provided a large volume and good geographic distribution of witnesses. Below is the trajectory estimate we plotted for this fireball. If you witnessed this fireball event please fill out an official fireball report with the American Meteor Society. A lantern balloon is not going to be the size of a full moon unless its right infront of you. Seems like every time someone sees something in the sky anymore it’s just passed off as a lantern balloon somehow. I know, it is so ridiculous. People seem to be apologizing and making excuses for witnessing things they can’t explain or that is very unusual. The “lanterns” are a convenient way to tell people “I’m rational and know that anything unusual in the sky must be a chinese lantern.” It’s just pathetic. Seen bright green slow moving fireball along with 3 other people at 23:05 ,may 30 2013 last night looking west. It went south to north. Was the nicest, prettiest meteor I have ever seen in many years. No sound. Had burning tail with pieces breaking off of it. Very cool! My wife and me were coming back from Cleveland last night and I saw it just 30 minutes south of the Cleveland area. My mother and I were sitting by our pool and we saw this bright fireball/shooting star move across the sky. It was around 11. Very beautiful! Lasted around 10 sec. Great way to start off summer! We was having a bonfire at Sistersville, WV near the Ohio River when we seen it falling from the sky. Bright green and just falling apart as it approached closer. Very cool! We were fishing at Huston woods last night when we saw a bright light in the shy. It was so amazing and it came right over the lake and then disappeared. It was bright and falling and then it was gone. Huston woods is in oxford,ohio.I was glad i got to see it in all its glory as it disappeared. I live in Newport, Kentucky where the skyline of Cincinnati is quite visible and beautiful. I was sitting on my front porch around 11 pm. All of a sudden, right above me, there appeared, I thought at first, a single firework. I then realized it must be a meteorite. Wow! It’s duration had to be at least 4 seconds long. It was bright yellow in appearance with a thinning tail. I didn’t hear any noise or feel any vibrations. I quickly recalled seeing the videos of the meteor over Russia from February of this year and slightly ‘ducked’ in posture, in case of a sonic boom. Me my girl friend and friend jake saw it last night also, In Ironspot near Roseville Ohio. it was burning out and changing colors as it went out. I saw it right when it started falling. sitting out on the patio last night with some friends…in the Anderson/Withamsville OH area, off of beechmont ave i thought i was the only one who saw it as i was in shock when it first appeared, but i was able to mutter out and slap one of my buddies on the arm and yell LOOK…so a few others were able to catch the last 3-5 seconds of it. Id say all in all it was visible for roughly 10-15 seconds. I saw it too..we are in Amelia. we are in northwestern , ohio. Defiance county, Ohio very beautiful fireball in the sky.l was not sure what it was until looking for reports of a meteor online. I’m in Defiance, OH as well. Our school’s 2nd grade camping trip was last night. As we were walking back from our night hike around 10:15-10:30, we were all commenting how beautiful the huge full moon was. Then out of nowhere, this meteor appeared, low on the horizon, in the most amazing shades of emerald, blue and orange. For us as well, it was moving south to north. What a treat for our group of ten 8-year olds (and their chaperones!) to be outside, in a dark area, way past their bedtimes on a school-night! Seen it over ohio I was heading west on the lake and I thought it was heading west as I seen it I was looking south southwest and the tail was to the east of me it was beautiful.. it was low and I seen a white ball with a purplish area between the head and white tail that you could clearly see breaking apart.. I only caught the last few seconds before it disappeared. It wasn’t the superfast high in the sky meteor I normally see on occasion. Dont have the exact time but the times that you are reporting is consistent with my ride home from work and when I usally pass down that road.. I was sitting on my front porch of the house which faces due east. A bright greenish object and trail with lots of spark moved south to north losing descent behind the treeline and the FSA building on South Main Street, Kokomo, IN. There was one great flash almost immediately upon seeing it and another light halo flash as it dipped behind the treeline. I seen a large orange streak moving very fast in the sky around 11pm while taking my dog out to go do his business I passed it off as a shooting star till reading reports on Facebook and seeing the news reports. Seen this in Camden, Ohio while fishing at Catfisherman’s Paradise.. It Flew right over top of us. Camden, is Northwest of Cincinnati and is pretty much open farm land so we got to see it for about 30 to 45 sec’s est time. I was driving south on I71 around Mansfield, OH, when I saw it appear to be moving east to west. It was bright green and the tail was like a sparkler fizzing out and fragmenting. Lasted around 5 to 10 seconds. Was amazing. I kept looking for more to come. One of the coolest things I’ve ever seen. Definitely not a shooting star, it was close. i live in mason west virginia i seen it over pomeroy ohio till it went below the horizon it lasted about 7 seconds . it was white with a blue green tail . I was driving to a friends house and at about 11pm I saw a large blue, green, and yellow meteor shoot across the sky from horizon to horizon…luckily I was at the top of a hill and able to witness this. I was in Washington, Pennsylvania. Absolutely beautiful! My wife and I saw the meteor streaking across the sky on our way home on the motorcycle around 11 pm in Columbiana Ohio. We thought it was an airplane getting ready to crash at first because it looked like an orange fireball coming from the south and going west. It turned bright green and had a nice tail before disappearing halfway down the horizon. It was the biggest we had ever seen. Very exciting to witness. I am in Westerville Ohio at the northern edge of Columbus. I was sitting outside around 11 pm and saw the meteor to the west. I didn’t hear any sound or see any colors it just looked white to me.It was traveling from the south to the north and it had a tail following it. The sighting lasted around 7 seconds. Reading other posts some people said they were looking east when they saw it. That must mean that it wasn’t very far away and fairly close to the earth. Does anyone know of any video taken of this event? Sitting outside in the country of Libery, Indiana(about 50 miles North of Cincinnati) around a bonfire with 6 other family members about 11 pm we all watched as this beautiful shooting ball of color (orange then blue/green with a white tail) flew across the night sky. we knew it was more than a shooting star! It drifted over us for about 5-10 seconds! We were very excited to have been lucky enough to witness this beautiful sight! Amelia is about 20 min east of Cincinnati. I saw in Liberty, Indiana while camping @ Whitewater State Park…bright white..then pale orange ending as bright neon green color….I posted on my Facebook..just after..just past 11 pm…It was beautiful ….was hoping it wasn’t a drone or missile. Was watching TV in my living room about 10:30 or so on 05/31/13. I had the curtains open and I saw a ball of flames come over the tree line. I was shocked to see it and quickly called my husband over to see It. We both ran outside to look. It did not have a tail, but it had flames coming out all over it, flames were orange yellow, ball of flames was large in size, came south to north. This was amazing to see. We watched it until it went out of site. I live in northern Michigan, Buckley. We were having a party at our house in Mooreland, IN when all of a sudden a bright light appeared in the sky. It was so beautiful and shocking to witness. I couldn’t get the words out of my mouth to get everyone’s attention so I just muttered sounds and pointed to the sky. Haha! Fortunately, it lasted at least 10 seconds and everyone who was here was able to catch a glimpse of it, including our friend from Germany. I was looking eastward and the fireball was traveling from south to north. I recall a mostly white, large center mass, with a long tail which seemed to have blue and green colors trailing behind. What a great experience! I saw this as I was driving home from work in Indiana, Pa. It looked like a shooting star, but it was much larger than any others I have seen in the past. It had a tail that glittered. I did not get to observe it for more than a few seconds though since I was driving. My friend, her mother and I were watching TV when we hard a loud noise. sounded like something had his the house, it was around 11 on may 30th. We had no idea what it was. But it seems it was a sonic boom from it hitting somewhere not far. This was in Dayton, OH. We were leaving out of Louisville, KY headed on 71 N towards Cincinnatti, OH – It appeared from my right crossed in front of us going across the sky. Started out looking like a falling star but turned much brighter. Went from Lime Green to a darker green and alot larger with an orange, sparkly tail…turned orange and disappeared. One of the most amazing things we have ever seen in our lives. So happy to be able to witness. Seen something really bright go across the sky around 11:15pm June 4. I live in Taft, California and have never seen anything like it. i am from richmond, kentucky 40475 on 5/30/13 at about 1 am eastern time i saw a green fireball suddenly start glowing in the sky like it caught fire descending rapidly to the north and slightly west of me. it was about half the size of the moon…. getting smaller as it descended. i witnessed it for about 4 seconds before it shrank and was unsee able. my brother and friend both were there and witnessed it too. I was at work by CVG Airport saw the fireball moving east to west very colorful with the green tail. When I got home from work the best part is my 14 year old son asked me if I saw it . We are so happy we both saw the same one but we were 12 miles away from each other. This was his first sighting. Around 1 am something sounded like thunder shock my house but there was not stoming and my power flickerd off and on. it was loud. and I was live in maiden and it sounded like it was behind my house. Around 00:30 est we were surprised by a very large explosion sound that rumbled our house. We live in Lincolton, NC and the sound was heard from one of our friends in Maiden, NC at the same time.I called it into local police but they had not heard from anyone else at the time. I was out in the patio at night in south Charlotte, NC. The sky was lightly overcast. I noticed the yard gradually lit up fairly brightly and for a second the furniture even cast a shadow. I initially thought someone setoff fireworks, but the light and cast was white, almost bluish. I did not hear any sound so soon I thought it must have been a meteor. Interesting to see this report. My girlfriend and I were walking around my neighborhood late last night at we got blessed with the opertunity to see this. I live in concord NC and the meteor came in a lit up the nights sky. It looked like it exploded at the end and about two minutes later we heard a boom. The coolest thing I have ever seen in my life!! I’m so excited I came across this article because I was standing on my porch and saw this but didn’t know til now what in the world it was. Awesome!!!! Hi I’m not sure of what I’m seeing is a meteor but driving home just now, my husband, son, and I saw flashing lights in the sky. Something kind of like a strobe light. It was really big and orange in color. Now that we are home, and considering the tall tree, we only see it flashing but now it’s more whitish in color. It’s flashing about every 45- 50 seconds. It doesn’t seem to be moving. It’s flashing in the same place everytime. I was wondering if you knew if there was anything going on in the sky tonight. I’m in Pocono Lake, PA. It seems that you may be seeing a stationary satellite. Meteors may flash as they enter the atmosphere but once they have disintegrated, that’s it. Stationary satellites are not really stationary, but have an orbital period similar to the Earth’s rotation. Therefore they appear in the same area of the sky. The flashes are probably caused by glints of sunlight reflected off the satellite as it rotates. I took some photos from Monday’s morning sky and have 3 photos where it looked as if a Meteor had hit. From the angle of the black smoke trail or whatnot. (Looks like a meteor trail. Wish i had a way to upload them here. Just bringing this up because i was completely baffled when i saw it but heard no reports of anything here in Charlotte N.C. So now maybe i have an explanation for my photos. I saw something burning falling from the sky it eventually burned away. This was this morning around 7:15 over Cincinnati,Oh. Went away quickly but it was a very bright light. I saw it headed towards Christ Hospital when I was going in to work this morning. I thought a projectile was headed to a collision with my hospital. It was extraordinary! Never seen anything like it in my entire life. The colors I saw were blue, red and yellow/orange. Beautiful but frightening at first. What was it?! I saw a green fireball in the sky this evening just south of Louisville Kentucky. My 13 year old grandson and I had just returned from a program at Kenyon U. about the solar system and a visit to the observatory. While at the observatory, we saw a “shooting star.” We got to bed when about 11:00 my grandson yelled, “Woa, did you see that bright light in all the windows?” He guessed it was a meteor. What a coincidence to end our evening learning about the night sky. We live east of Mount Vernon, Ohio. We saw it from three miles south of Monroe, OH. It was in the east / northeastern sky and was obscured by my neighbors home. We were startled by the bright flash which appeared whitish-blue to my eyes. The flashing wasnt caused by light reflecting off of anything. It was way way to brilliant. It was generating the briteness itself. While It may not have been a meteor, it could be a piece of satelite technology that was crashing. The crazy thing, is the flashing looked like a flash of lightening, like in the Midwest when lightening hits our electric boxs on the pole, they explode and flash in the same color. At 6:53 this morning in Marysville, OH I spotted a fireball. It was most brilliant and beautiful.